Man created war and is now trapped in his own creation. Somebody told me that, a long, long time ago. The person who told me that believes that there’s no way men can escape this game once it’s set in motion. I used to agree with that opinion. Not anymore. Not after I heard about an unhistorical idea conceived by Toyotomi Hideyoshi, when he was still a shinobi serving Oda Nobunaga. Unhistorical? Yes, it was said by Toyotomi in a gekika manga created by Kazuo Koike and Goseki Kojima, Path Of The Assassin, the story of Hattori Hanzō, the master ninja whose duty it was to protect Tokugawa Ieyasu. The idea was actually very simple it’s brilliant. To rid the world of war completely, men do not really need to try to hold on to peace. Trying it will only create a situation we’ve already k experienced before, and that’s what we called Cold War. Trying to keep the peace forced us into a sort of global Mexican stand-off called MAD (Mutual Assured Destruction). Both sides take the idea that if you want peace (and to maintain it) you have to be ready to go to war. That will work up to some degree, provided both sides are led by level-headed sane leader. No sir, that’s not a good way to rid the world of war completely. Definitely not by trying to keep such a forced peace. Instead, men need a totally new general rule of war. We are all aware that in a war it is the soldiers who fight in the front, led by their officers, with the generals planning the steps behind them, and the supreme leaders waiting and giving orders from their castles. Like flies, the soldiers are the first to die. That’s the general rule of war. Now, what if all supreme leaders of each nation in the world are to agree to an agreement that in any war it have to be the supreme leaders of each party who fight first? And when the supreme leaders fall, it is the turn of the generals of both sides to fight each others? And when the generals die off, it is the turn of the senior officers to fight? And after all the senior officers of both sides bite the dust, it is the turn of the junior officers of both sides to fight each others? And the soldiers are the last to go to war after all the officers and NCOs are gone for good? Very likely, when the soldiers are the only ones left to fight (and of course their numbers are far greater than all the supreme leaders, generals, senior officers, junior officers and NCOs put together), they already lost the reason to go to war. Why? It’s simply because a war is always started by the supreme leaders, no matter what their excuses are. This idea is very simple it’s brilliant. Unfortunately, it’s also too sane for this insane world. “Son, what do you want to be when you grow up?” I was three or four years old when I was first asked this question by my father. Like most other people, this question was repeatedly asked to me over the years. And like most people, I gave different answers for any different period. For a brief moment, whenever I was asked this question, I thought I knew the answer. However, as I grew older, I found it more and more difficult to answer the question, because I learned somewhere along the way that although it’s normal for people to imagine growing up and working their dream profession, most people simply grow up and be perfectly content working in an occupation completely different from their wishes. These days I find out that it’s becoming more stressful for any young people to answer such a question. Most of the high-school students I know only know the world around them, which usually includes television, smartphone, and what their parents do. Their career goals are heavily influenced by their present culture and surrounding, but most of time, after they have a better understanding of a job’s requirements, they change their plans. They find out that’s it a world totally different from their previous expectations and most don’t like it. Sadly, some (if not most) of them simply waste their time by hating the world instead of trying to create a world they can fit in. My case is, more or less, the same. Different career goals, including being a comic artist and a diplomat, were set on my mind over the years. And over the years one goal replaced another, depending on the situation and surroundings as I grew up (a voice suddenly comes out of nowhere, “What do you mean, ‘you grew up’, kid?” Ha-ha, very funny guys, you may jump out of that window now). I suppose that’s the way it goes, goals simply come and go. I owe the first one to the J-Dorama Tokyo Love Story. I saw a scene of a crowd of expressionless people going to work. They looked so much like robots and I think to myself, “Somewhere along the line, those people used to cheerful and playful children; happy and content with their lives. What went wrong? What turned them into such joyless rubbery working machines?” and I came up with the idea that they simply let their lives flow like a river, instead of making it like a dam. And it’s all because they don’t know who they really are and what they really want. That’s when I decided to learn more about myself. I took a semester break (unauthorized, of course) to travel alone. I thought that if I want to know myself, I have to see how I function with a bigger world with unknown possibilities. What did I find? Only one thing and that’s that I like people. I vaguely concluded that I don’t want a job providing goods, but the one providing services. The two other factors simply follow the first one naturally. So here I am, not really a rich man but well above average with an occupation I can enjoy. Am I happy? Without being as pretentious as saying that I am a happy man, and without being discouraging as saying that I am disappointed with my life, I can say that I am content with what I am now. I still want it, though. A tart with a heart is a stock character found in many literary works and movies. If you remember Julia Roberts’ character in Pretty Woman, that’s probably the most commonly accepted example. It is simply depicting a bad girl outside with a heart of gold inside. I’ve seen so many depictions of this stock character, either in literature or movies, that I found it a cliche. Good look, bad luck, bad environment, conscience of gold inside, over and over again. The stock character became a great pathetic bore to me. So anytime I found the appearance of this character I treated it with a suspicious skepticism, thinking that it would be like any other typical ‘tart with a heart’. I became desperate to see a different take on this character. 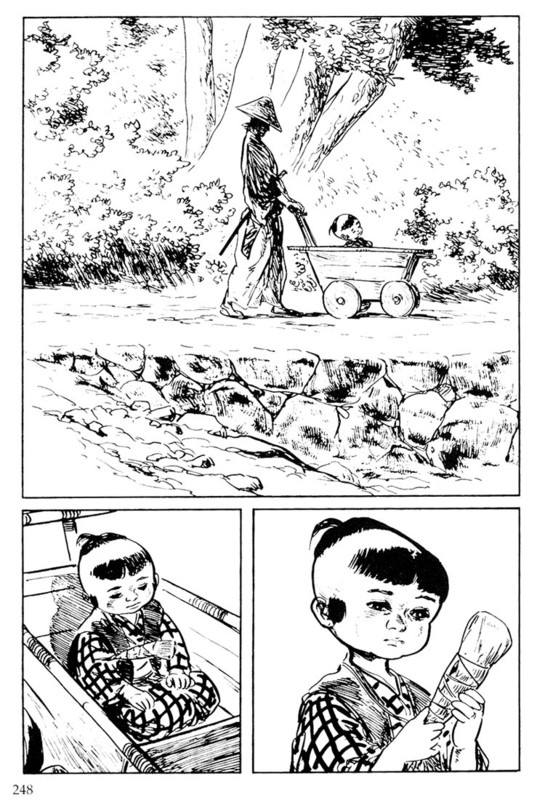 Enter Lone Wolf And Cub. Surely enough, a tart with a heart makes several appearances here. I didn’t expect much, so I wasn’t too disappointed to see that they’re still the same old character with little variation on the backgrounds. When I reached Volume 19, Chapter IV, “A Mother’s Flavor’, I still didn’t expect much until I finished this chapter. Clutching at the book tightly, I saw that my knuckles went white. The most surprising thing is, I felt a lump in my throat. What’s wrong with me? The last time such a thing happened to me was when I watched the film ‘Questo sì che è amore’ starring Sven Valsecchi many years ago as a 9-year-old kid; another lifetime, another me. I didn’t read the next chapter that night. Instead I read that fourth chapter over and over again, and it still had that same effect to me. I began to tell myself, “This feeling, it will pass. In the morning it will pass. Sooner or later it will pass. No way it will last forever. In the morning it will pass.” It didn’t. What’s so special about this chapter, anyway? To begin with, it’s just a story of the woman O-Sen, “… a daruma prostitute, the lowest of the low, since she was eighteen… a woman with nothing but will… a woman who had lost her human heart…”. Just one of so many people encountered by the wandering ronin Ogami Itto and his son Ogami Daigoro on their quest of vengeance, another tart with a heart; or so I thought. 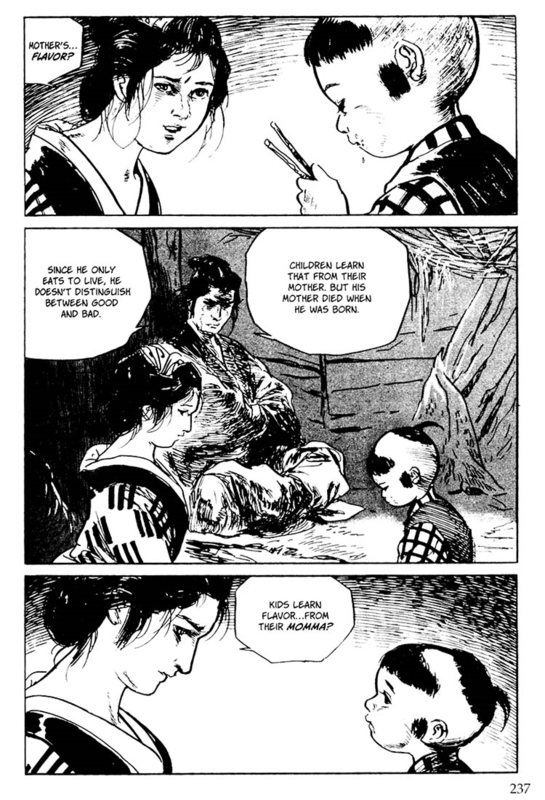 In a desperate attempt to free herself from her pimp, she followed Itto & Daigoro, correctly calculating that with the Lone Wolf and Cub beside her no one would dare to do her any harm. Inside a hut, Itto gave Daigoro and her dried rice to eat. Finding the taste disgusting, she couldn’t bear to eat it. Instead she tried to cook her own rice for herself and Daigoro. Unfortunately, being a ‘woman of the floating world’, she had forgotten how to cook rice properly. It turned out that Daigoro ate the rice with gusto, despite the taste which she said “not fit for a dog”, because he was eating to live not for luxury. 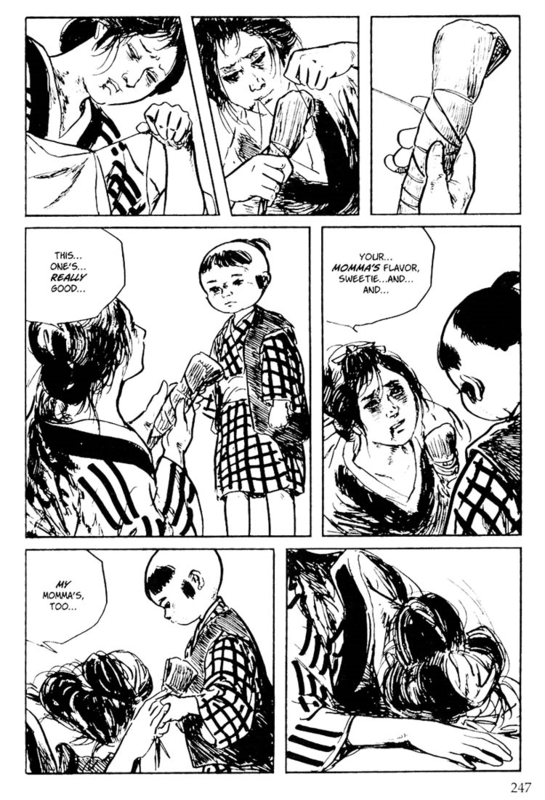 As Itto explained that Daigoro never knew his mother’s flavor, O-Sen began to experience a change of heart. Previously she remembered how her mother cook the “best rice” before she was sold to the brothel, then she began to feel a real sympathy to Daigoro who never learned about flavor from his mother. The next morning she made up her mind to make a real good rice, thus teaching Daigoro a ‘mother’s flavor’. As she went out to find some leaves to wrap the rice she was cooking, the Yakuza enforcers found her. One of them managed to slash her with a sword, mortally wounding her. Despite her wound, O-Sen kept on running and return to the hut. Dying, she still managed to finish the cooking, wrapped the rice and gave it to Daigoro, telling him that it’s his momma’s flavor, as well as her own momma’s flavor. Then she died. On the next page, Daigoro is seen holding the wrapped rice. Just holding it, staring at it. This O-Sen, she is not a tart with a heart. She is an expansion of this stock character. She is what I call “a tart who regains her heart”, a far more difficult character to create and even harder to picture. From my point of view, it is possible to hold on to your conscience no matter how low you fall. However, once you’ve lost your conscience, it would be really-really-really hard to regain it; if not downright impossible. This is what O-Sen character means to me. She is a remainder of how precious human heart is.